Greg and Tammy Vanhouy found out about Philly’s Sports Bar and Grill 10 days before the game and skipped the hassle of parking, traffic and tickets to enjoy the game at the establishment. Kyndall Holstead (left) and Brandon Cheshire watch the Crimson Tide take on Clemson at the Half Moon Windy City Grill in Phoenix. 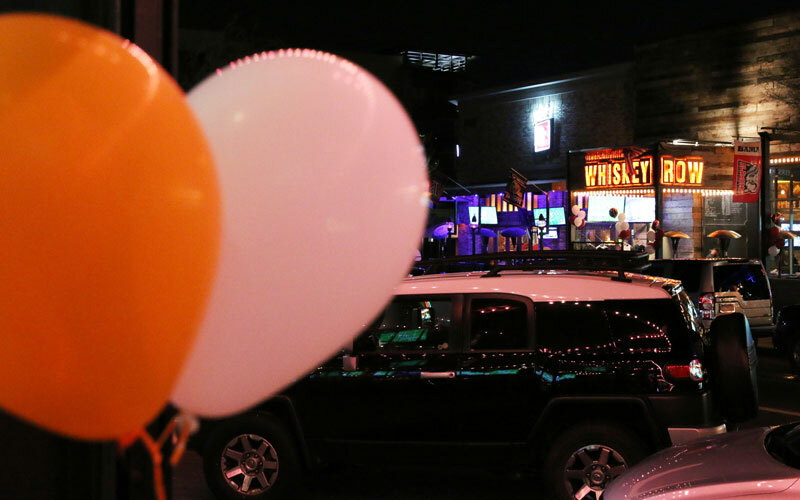 The orange and white balloons fly for Clemson at El Hefe, but across the street the colors of the Crimson Tide fly high in this Battle on The Block. 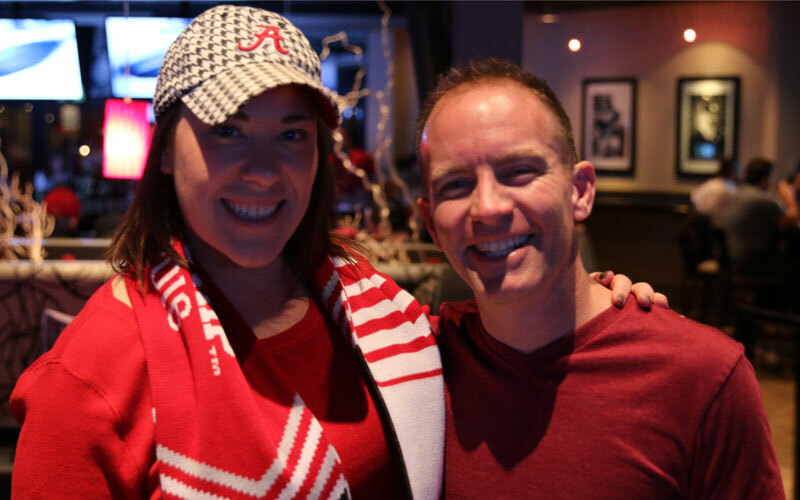 The Half Moon Windy City Grill in Phoenix was decked out in the classic red and white of the Crimson Tide as Alabama fans filled the bar to cheer and jeer. The restaurant has become a local home for the Alabama alumni group which has gathered to watch the games on Saturday afternoons for eight years. The restaurant contacted the school and hosted a meet-and-greet Sunday for the alumni coming from Alabama, which included over 200 fans. Whether fans were at the game in Glendale or hit the bar scene to cheer on their team, crimson and orange painted the desert. Two bars started a rivalry on their own. El Hefe hosted Clemson fans and Dierks Bentley’s Whiskey Row welcomed Crimson Tide fans in Scottsdale. The two restaurants are across the street from each other, well within distance to see the other team’s flags and balloons flying from the rafters. Mike Natale and his wife flew into Phoenix from Alabama to watch the game with their daughter, Carter, at Dierks Bentley’s Whiskey Row. Carter Natale once lived in Alabama but now resides a block away from the bar. The Natales attended the “Battle on the Block” because it was close to home. 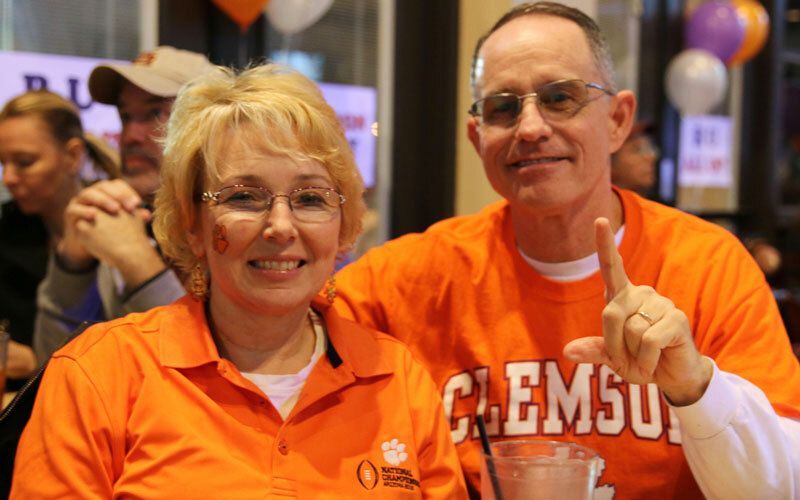 A little farther west, Clemson fans watched the big game at Philly’s Sports Bar and Grill, which featured Clemson-colored balloons throughout the establishment with many signs sporting various slogans backing the “all in” sentiment of the Tigers. Dan Crenshaw, a graduate of Clemson in 1969, has lived in the Valley for 16 years but recently discovered this spot and was viewing his third game Monday at the restaurant. Watching the game, he pointed out the legions of Clemson fans at University of Phoenix Stadium. “I think Clemson by far has the No. 1 fan base in the United States,” Crenshaw said. However, they didn’t leave happy, with Alabama’s 45-40 victory.